First, the islands. The Argo-Saronic archipelago, including most people’s favourite, tiny Hydra, with its chic boutique hotels occupying restored neo-classical mansions, and Aegina, with its pistachio orchards, lies the closest to Athens. The Cyclades, of which the most popular are Santorini and, tend to be rocky and arid, and are known for their iconic whitewashed cubic buildings. Santorini and Mykonos are Greece’s most commercial and expensive islands, and also home to the highest concentration of five-star hotels, attracting international travellers in search of glitz and luxury, while smaller islands such as Antiparos and Koufonissi are more off-beat and restful. The lesser-visited Northeast Aegean islands centre on Mytilini (aka Lesbos), where anise-flavoured ouzo comes from, and Chios, with its medieval villages and mastic trees. The biggest Greek island, Crete, stands on its own, rising proudly from the Libyan Sea and facing towards North Africa. 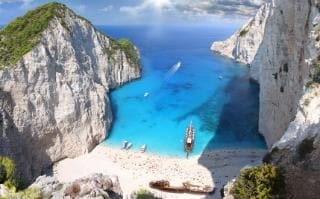 Its main entry points are Heraklion and.The only islands that are not accessible by boat from Piraeus are the lush green Ionian islands, with most people’s favourite being Corfu. The Ionians tend to be favoured by British holiday makers (and Italians in August), and cover a broad spectrum from the budget to the luxury markets. They also have some outstanding beaches. Northern Greece, which centres on Thessaloniki, is popular with holidaymakers from Bulgaria and Serbia, who stay at the big modern seaside resorts on, close to the monasteries of Mount Athos (which occupy a separate peninsula).